As I mentioned in my previous post, I started to GM another Pathfinder Adventure Path, with the novelty that this time, I would run it online instead of at a table. I use Roll20 to show my face-to-face players maps using a TV, so I had an account already, but I haven’t used the platform for its original purpose, as a virtual tabletop for people who can’t play locally with friends. It was a close call, really. I still dream of running Zeitgeist but I am glad it didn’t win the voting, because it’s not tailored to new players at all. Tobold is currently running this campaign, and I enjoy reading his session reports. In the end, Legacy of Fire won by the skin of its teeth versus Hell’s Rebels, which was my favorite. The latter uses elements of weekly rebellion actions that remind me so much of Assassin’s Creed 2 and setting up the Assassin’s. It’s very heavy on social skills (at least the first adventure that I have read) which I adore, and has gorgeous artwork. But alas, no. Hell’s Rebels will definitely be the campaign I run next, for damn sure. Legacy of Fire did win, and it’s a fine winner. It’s Paizo’s 4th adventure path, from 2009 and the final one using D&D 3.5 rules. Thankfully, the Paizo messageboards are a treasure trove of wonderful information and someone else has converted all six adventures to the Pathfinder ruleset. Hooray! There are also additional set pieces, maps and other content there, though not anywhere near as much as for Rise of the Runelords. It’s not a super-popular AP, which I don’t understand, because the first adventure is an absolute delight and easily beats Burnt Offerings, in direct comparison. For example, it nicely deals with one of the issues that I had with starting Rise of the Runelords. In Legacy of Fire, the adventure party are all hired by the majordomo of a merchant princess of the desert and trading nation Katapesh, to join an expedition to claim a village that was abandoned 20 years ago and is now ruled by a tribe of gnolls. By the start of the game, the party has traveled together for a week. This solves the problem that I had in RotR. There, my adventurers didn’t try very hard at first to have reasons to adventure together, and it was a bit like pulling teeth. I enjoy it’s different here. 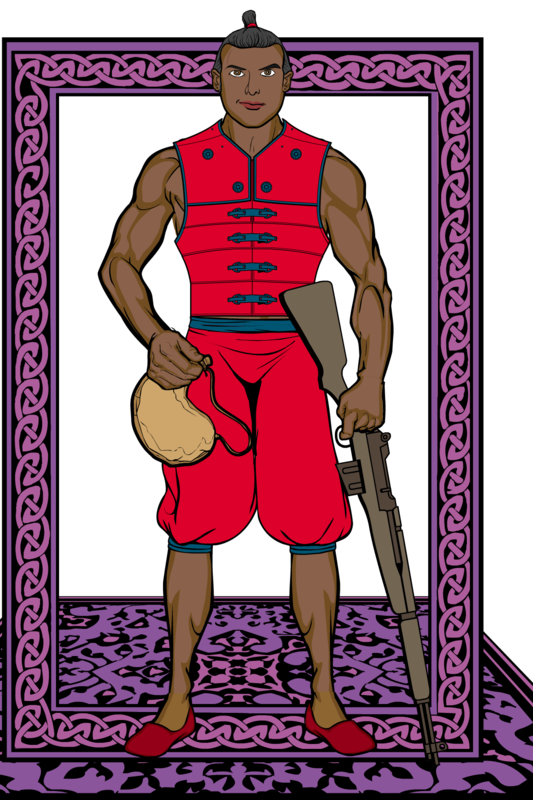 Qusai – this jock who used to be the captain of his ruk team (a popular and fairly brutal ball game in Katapesh) is a trained gunslinger and likes to shoot things with his musket. If need be, he shows off how awesome he is by shooting cacti. Tefya – a human paladin dedicated to Sarenrae, she was trained in the Lambent Citadel of the Dawnflower in northern Katapesh and is now looking to free Kelmarane to build a church or rebuild it, to honor the goddess of sun, redemption, honesty and healing. Tillous Borde – a fellow ruk player from Qusai’s team, this rogue is used to doing shady deals in Katapesh’s famous Nightstalls, its most infamous market, working for a gang. Now he’s looking for adventures, and maybe learn more about his family’s history in the abandoned village of Kelmarane. This is Qusai, as created at http://www.heromachine.com/. Spiffy tool! The intrepid heroes traveled on camel-back for a week, to their destination Kelmarane, a small village near the mountains, which are packed with many tribes of gnolls, the largest led by a ruler called the Carrion King. The heroes were traveling with the majordomo who hired them, to join the rest of the small expedition. The expedition is led by Lady Almah Rovashki, and Kelmarane used to be the ancestral home of the Rovashki family after they first arrived from Varisia. Lady Almah is joined by four Pactmaster guards, six mercenaries, a gnoll expert called Dashki, an alchemist and healer, Zastoran, and a married couple, Hadrod and Hadrah who tend the livestock, plus Garavel, the majordomo. When the party arrived in the camp near Kelmarane, called Sultan’s Claw for the giant tree at the campsite, a chaotic scene was observed, because one of the expeditions wagons was on fire. The party immediately got to join the efforts to contain the scene. Tillous and Kiva helped with carrying buckets of water to the burning wagon, or rather, one of them did that, while Kiva threw the buckets from the water cart, cackling gleefully all the while. Two of her throws missed, which caused the Pactmaster guards to be very disgruntled with her, for soaking them and actually wasting precious water in the desert. Tefya and Qusai helped the mercenaries to push a wagon close to the burning one away, to stop the fire from catching on and destroying supplies. Tefya turned out to be just a whee bit clumsy and instead of pushing the wagon ended flat on her face. Eventually they managed to push the wagon away, so Tefya was able to join Zastoran with stabilizing two mercenary guards with severe burns who had tried to save the inhabitant of the burning wagon, one Varisian astrologer named Eloias, who alas perished in the fire. I really enjoyed to run this introductory fire scene. There are four different ways for the PCs to get involved right off the bat, get those dice rolling and feel awesome. Or not so awesome, as poor Tefya’s dice were cursed for a while. It also was a nice and easy way to introduce Pathfinder D20 rules to the tabletop newbies with a few nice and easy skill checks, while at the same time establishing RP connections to the expedition NPCs. The PCs unfortunately couldn’t handle the fourth task that was available, as not a single one had learned Handle Animal as a skill, which meant that they didn’t earn Hadrod and Hadrah’s undying love for dealing with their livestock during the fire. After the chaos was over, Lady Almah summoned them to her tent, to get a proper introduction to them, and so that she could determine how each individual could assist the expedition. She then tasked them with investigating who set the fire, as the party and the majordomo were the only ones not around when the wagon went up in flames. The party dispersed around camp to investigate the burnt remains, spying the very unkempt and suspicious looking gnoll expert Dashki who had been mysterious absent while the fire was raging. The party found out all sorts of tidbits about him, e.g. that he is not very popular, has an obsession with Lady Almah and was jealous of her attractive astrologer. All signs seemed to point at him being the murderer and arsonist. They also found out that the livestock people were looking for their favorite goat, Rombard, who had gone missing. Kiva doggedly followed Dashki around camp and made him mad, until he babbled that the fire was laid by pugwampis, evil creatures all over the area who are known to bring bad luck to everyone, hated even by gnolls. When the party was asked to draw a conclusion after their investigation, Lady Almah was not ready to condemn Dashki without direct evidence and instead tasked him and the party to bring her a pugwampi immediately, despite it being night, if there really were as many around as Dashki claimed. Overall, I thought the party did excellent with the investigation. There were a couple of clues that they missed because they either didn’t ask the right questions or didn’t use Diplomacy to make their overall impressions more favorable. I had lots of fun RPing the camel-driver couple and Dashki. I have to work on my accents though, as all my Katapeshi expedition members pretty much sound Indian. Maybe I should find out, what accent Arabs have when they speak English. We concluded the session there, and I am looking forward to the nighttime foray in the desert next Friday. 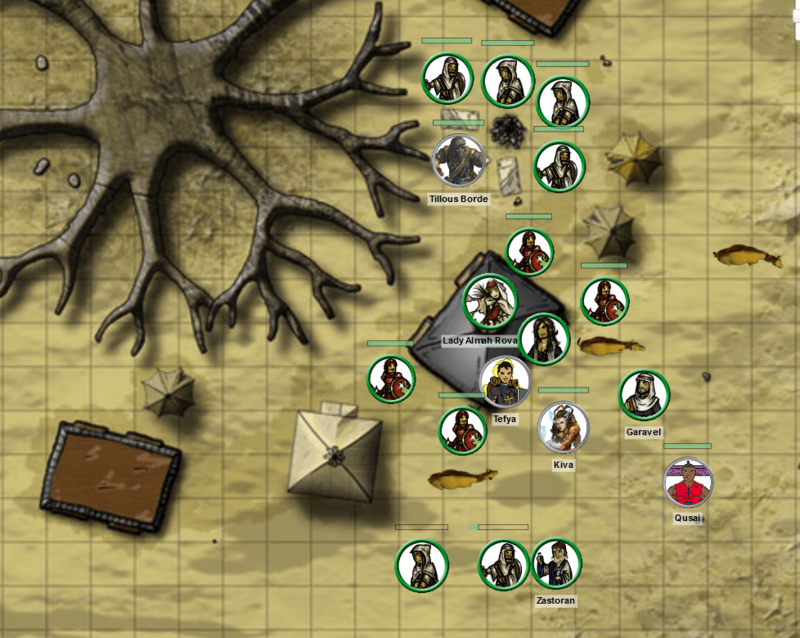 A view of the camp in Roll20, with lots of tokens. As far as technology went, Roll20 was great. I had some issues first because in Firefox, audio and video didn’t work at all. I switched to Chrome and it worked. Still, a bit irking. I actually went ahead and purchased the Plus plan, because I want to try Dynamic Lighting, and think they’re offering really fantastic service that I want to reward while we use it to play. The map I used I found on the Paizo messageboard, and I created all tokens, using the fantastic TokenTool in combination with Paizo’s Paper Minis for Legacy of Fire. I’m a bit more worried for when we come to the first real dungeon map that I have from the map folio. It’s a low resolution, and I have to zoom in so much that it doesn’t look very nice at all in Roll20. I am still pondering how to fix that, or am hoping that the players will forgive that it’s just a wee bit pixelly. I am also thinking about trying Dungeon Designer as part of Campaign Cartographer, but that’s a whopping 69 British Pounds for the cheapest bundle. A friend of mine owns it, so maybe I want to try it at his place first to see if I can recreate the maps there. I haven’t found any other mapping software yet.